FORBES AFRICA Publisher and Vice-Chairman of the ABN Group, Rakesh Wahi, was caught in the tremors and aftershocks of the earthquake in Kathmandu. 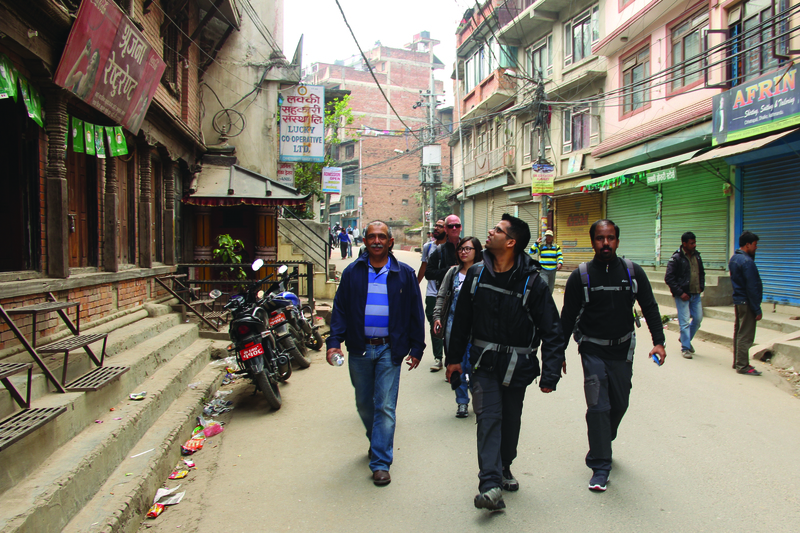 Wahi went to Nepal to climb Everest and ended up making a harrowing journey through the rubble. Within minutes of driving out the parking lot at the Kathmandu airport, the first earthquake struck. Our vehicles rocked from side to side, like boats on a choppy ocean. At first, we didn’t realize what was going on. When the shaking continued and we saw people screaming and running from the airport – we realized we were amid the worst earthquake Nepal had ever seen. In 2013, I took fifteen middle management executives from the ABN Group to the top of Kilimanjaro. Soon after our return, we started planning the next adventure – Everest Base Camp (EBC). The earthquake changed everything. When the tremors stopped, we had a chance to assess the situation. From the airport in Kathmandu, we could see black dust billowing from the city. The magnitude of the tremors was more than I had ever experienced in my life. We were told that the airport was closed and the runway had cracked. The intensity of the earthquake and the damage was not clear. It became so as we made our way to our hotel. By this time, all the residents of the city had moved into the streets. Dharahara Tower, the tallest building in the city, had collapsed. Icons, like the Dharahara Tower, are pillars of pride. When they fall, it makes people desolate and uncertain, particularly when most of the buildings are old and poorly maintained. The tremors continued at frequent intervals and in the frenzy our vehicles were separated. Our driver was young and seemed to have lost his nerve. He took us into a built-up area in the city, parked the car in an enclosed parking lot and without saying a word deserted us. We never saw him again. I was with Gary Fernandes and Biju Vetil who are both senior members of the Transnational Education (TNE) management. By this time, the network was clogged and we were unable to contact Chris Pilgrim and other members of our team in Kathmandu. We were, however, able to connect intermittently with our HR Manager, Bidisha Sen, in Dubai. The most important thing was to let everyone’s families know we were safe. By 1PM, my son Sidharth, who is based in Johannesburg, started providing me with information based on what he was able to pick up from news reports. We were told that there was another severe quake expected at 3PM. Since we were stranded, the three of us decided to go towards a canal in an open area until the next wave of tremors. By 4PM, we asked a person in the garage to drive us to our hotel; he reluctantly agreed. The journey was eventful as most roads were blocked by fallen buildings and debris. Kathmandu is an old city and the streets are extremely narrow. Another death trap was the low hanging power cables that are part of a dilapidated grid. While most of the city had lost power, there were still some main cables that burst at the nodes as we were passing by. By this time, everyone had evacuated their homes and moved into the streets. By 5PM, we regrouped with the team at our hotel. The hotel was in disarray. All the guests had moved into the lobby and the small courtyard outside. It was getting a cold and people went to their rooms hesitantly to collect sleeping bags and blankets for the night ahead. I assembled the team and my first goal was to make sure that everyone was calm. I stressed that we had to stay together and the safety of our team was paramount. We agreed that we had to abandon the trek and plan an exit strategy. The airport was closed. Our next option was to get transport to the Indian border and cross to Delhi to fly to Dubai. This needed visas from the Indian embassy as we had four other nationalities: Canadian, Chinese, Filipino and Egyptian. We were told that the Indian Air Force had deployed C-130 aircraft to evacuate Indian nationals. The team agreed that we were not going to evacuate piecemeal until there was a proper plan for each member. It was clear to me that I would be the last to leave. I also realized, rather than listening to rumours, a physical recce of the airport was needed so that I could decide whether it was going to be an air evacuation or by road. The news from social media and family came in. The extent of the damage was not clear but by this time we knew about the avalanche at EBC, the devastation at the epicentre and the rising casualties. We could hear the sirens of ambulances and rescue workers moving around trying to help people trapped in the rubble. My team was tired and emotionally drained but never showed a moment of weakness nor despair. I wanted to make sure that we found a place to eat. The city had shut down; nothing was open other than small grocery stores selling water and basic food. People had left their place of work and returned home to care for their families. We found a small restaurant and were told the only dish they could serve was chow mein. The half cooked and barely warm dish was perhaps the tastiest chow we had ever eaten. After dinner, Chris and Biju went on a mission to find a taxi to go on a recce. They found a broken down vintage taxi that Gary and I rode to the airport. It had started drizzling and it was heartrending to see families, particularly children, sleeping on the streets. Some people were keeping a vigil to make sure that their groups were safe. To our delight, we found lines of tourists and expatriates lined up to fly out. The only operational flights were by the Indian Air Force which gave me the comfort that commercial airlines would soon start flying in. This is the information that I needed to have a proper plan for the next day. My wife Saloni had been in touch with all the airlines flying out from the UAE and had made tentative bookings for us on Air Arabia. By 3AM, our seats were secured on the 10.55PM flight from Kathmandu to Sharjah on Sunday. We had a sleepless night which saw several tremors, including a severe one at 5AM. It rained and was freezing cold. We had to move into the dining area where the guests were crammed like sardines. People were edgy, every time a chair moved they darted to the open courtyard. At 7AM, we received a princely breakfast of tea, slices of bread and jam. It was a blessing. At 9AM, the hotel owner came to meet us and offered us a lift in his van. The only problem was it was the team or the luggage; not both. Since we had over 12 hours until our flight, I asked him to take the baggage. Our travel agent assured us it would get to the airport. We decided not to walk through the built up areas as a lot of the buildings were unstable. We found a map and planned our more than 20 kilometer route along the canal and then finally on to the wide main road to the airport. The extent of the damage and the displacement of people we saw while walking was an eye opener. The open areas were packed and temporary shelters, of tarpaulin and plastic, were everywhere. Rescuers pulled dead bodies from the wreckage. We were full of remorse and knew it could have been us. After a six-hour march, that included the second-most severe earthquake at 1PM, we finally made it to the airport. We joined long lines of people waiting to board commercial planes. The airport had been shut down once again and we had no idea if we would fly out. My wife stayed in close contact with the airline and at 6.30PM told us that the flight had taken off from Sharjah. Hope was revived. We checked in at 9PM and the way the baggage was piled up in the airport, and the lack of any tracking and staff, made it evident that the luggage was not going anywhere. We boarded at 1AM and took off an hour later to the cheers of relieved and exhausted passengers. The ordeal, for us, was over. Our families and the hot coffee and muffins at the airport more than compensated for our lost baggage that we have no hope of getting back. I only hope the contents make it to the needy people of Nepal and not into the hands of thieves. This experience was a reality check. We often believe we are infallible; the truth is we are far from it. I was just happy that I could bring all members of my team back safely. I would not have been able to live with myself if anything untoward had happened. Our team members in Dubai and families stepped up and played a crucial role in lifting our morale. We went there for a team building exercise. Nothing prepared the team for a real life catastrophe that brought out the best in each of them and brought them together as a family and inspired them to contribute to the suffering people of Nepal.